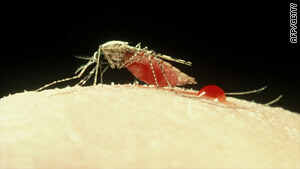 Bloody meal: An Anopheles stephensi mosquito feeding on a human host. Modified salivary glands of the Anopheles stephensi turned it into a "flying vaccinator"
London, England (CNN) -- They are normally transmitters of the disease, but mosquitoes could one day be used to tackle malaria after scientists developed a genetically engineered version of the species that can deliver a vaccine. Researchers altered the salivary glands of the Anopheles stephensi mosquito, dubbed a "flying vaccinator," so that it carried the Leishmania vaccine within its saliva. This mosquito, the main spreaders of human malaria, was shown in tests to transmit this vaccine when it bit its host, in this case laboratory mice, making it a transmitter of the vaccine. Bites from the insect succeeded in raising antibodies in the mice, indicating successful immunization with the vaccine, according to research published in Insect Molecular Biology, a British scientific journal. The study, led by Associate Professor Shigeto Yoshida from the Jichi Medical University in Japan, could be used to formulate a new strategy in the global fight against malaria. "The lack of an effective [malaria] vaccine means control of the carrier has become a crucial objective to combating the disease. Following bites, protective immune responses are induced, just like a conventional vaccination but with no pain and no cost," said Yoshida. "What's more, continuous exposure to bites will maintain high levels of protective immunity, through natural boosting, for a lifetime. So the insect shifts from being a pest to being beneficial." About 60 species of the Anopheles mosquito are vectors of the malaria parasite, which are transmitted to humans when the female feeds on blood. Every year about 250 million people are infected with malaria and nearly one million die, according to the World Health Organization. In Africa one in every five childhood deaths is caused by malaria, says the WHO. However, the researchers admit that there are barriers to using this form of vaccination in the wild, including issues of controlling dosage, "medical safety issues" and the "issues of public acceptance to [the] release of transgenic mosquitoes."